Why is this such a big deal? 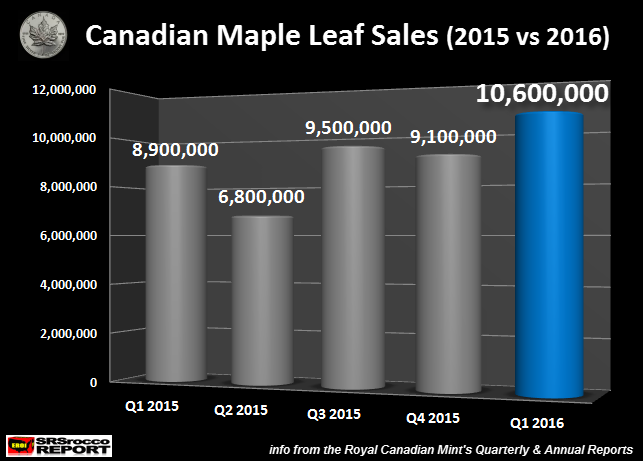 Because Q1 2016 sales of Silver Maples topped the Q3 2015 record, without surging demand and product shortages. Last year, there was a huge spike in silver retail investment demand due to the supposed “Shemitah” or the collapse of the broader stock markets. Investors piled into silver in a big way as they perceived a year-end market crash was inevitable. Actually, I was quite stunned by the figures published in the recent Royal Canadian Mint Report. Sales of Silver Maples jumped 1.1 Moz in Q1 2016 vs Q3 2015, with no real spike in overall retail investment demand. Which means, investors bought more Silver Maples in Q1 2016 than any other quarter in history. Furthermore, if Silver Maple sales continue to be this strong, the Royal Canadian Mint is on track to sell over 40 Moz compared to the 34.3 Moz in 2015. If Silver Eagle sales also continue on their strong trend of 1 Moz per week, the U.S. Mint could sell over 50 Moz of these coins. Together, these two official mints could sell over 90 Moz of Silver Eagles and Maples in just one year. This goes to show investors who are frustrated by the short-term price moves of gold and silver, that the market continues to purchase record volumes of these official coins… regardless. That being said, the precious metal community needs to focus on the Mid-Long Term fundamentals of buying and holding gold and silver. Precious Metals analysts would serve our industry better if we forgo the HYPE and $50 Silver & $2,000 Gold This Year MANTRA. I do believe the value of the precious metals will rise to levels much higher than we can imagine, but it will come when the Greatest Financial Paper Ponzi Scheme finally collapses. So, it’s best to continue focusing on the fundamentals, rather than short-term price predictions.